In a bid to essplayer in the premium truck segment globally, Tata Motors has started exporting the Prima series of trucks to emerging markets. The Prima range has already hit markets like Vietnam, South Africa, Malaysia and Kenya, besides other Asean, Arab and African countries. Tata Motors is primarily known for making medium-level trucks. Analysts say this is a brand-building exercise for the company as most of its volumes still come from medium-level models like LPT 2518, LPK 2518, LPK 1616 and SPK 1613. Since the demand for Prima trucks is limited in India, Tata Motors is trying to recover the cost of developing the platform from exports. Ravindra Pisharody, president, commercial vehicles, Tata Motors, said the export of Prima trucks will make a statement that even Tata Motors can make a premium product. “There is a market for premium trucks in countries like South Africa and Thailand. We were operating at a level below with our existing products, which means we were not present in the large part of the markets. With Prima, we will be accessing that part of the market,” added Pisharody. Pisharody also said that for the next couple of years, Prima trucks will be exported as completely built units (CBUs). If demand increases in near future, the vehicles could be assembled in the respective countries. Amit Kaushik, associate director, IHS Automotive, said this brand-building exercise will help Tata Motors’ consolidate its position as a commercial vehicle brand worldwide. 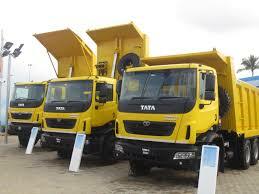 “Exposure to international markets will help strengthen Tata Motors’ capability as commercial vehicle manufacturer. The company will try to leverage India’s low manufacturing costs to provide premium vehicles in competitive prices in emerging markets,” added Kaushik. The increase in CV exports had a positive impact on the company’s capacity utilisation levels, which are now 60-70%. Tata Motors exports 50,000 units per year, which constitutes 12-13% to total volumes.